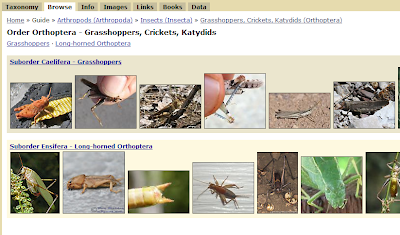 I posted photos of some pretty interesting and beautiful insects yesterday, and since I had included the names of some of them I received several requests to explain how I identified them. 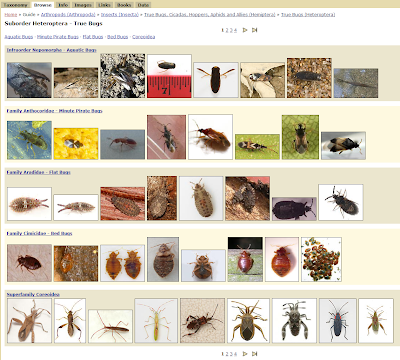 Today I'll explain my methods, and will try to determine what the unknown bugs from yesterday's post are. Note that I'm not an entomologist -- amateur or professional -- but I have a good eye, patience, and an Internet connection. 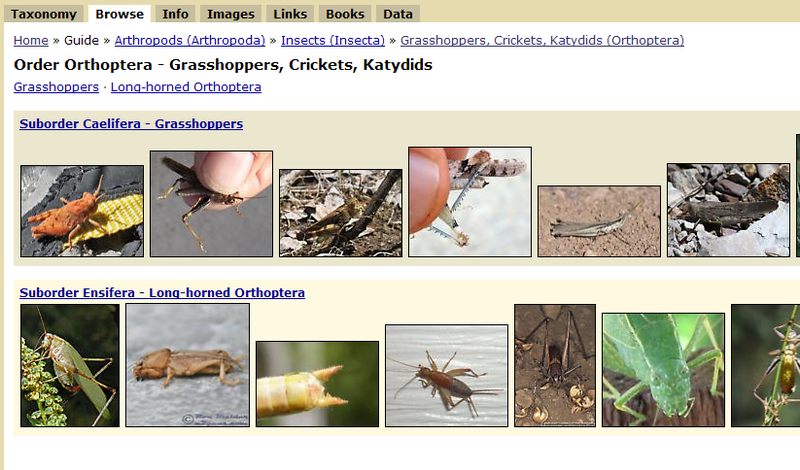 With these tools I feel pretty confident about finding at least a general idea of what the unknown insects I find are. 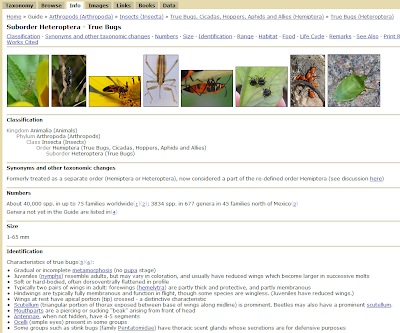 My main tool for bug ID is www.bugguide.net. It's a fantastic site, but it took me a while to figure out how to get results from it. I hope what I show today will help you use that site to identify some of the tiny creatures that inhabit your garden. 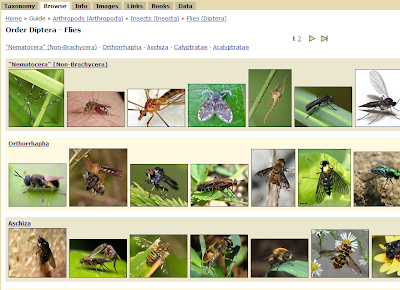 It shows the different "categories" of bugs: beetles, flies, bees, grasshoppers, etc. Move your mouse over each illustration to see its name in the tooltip that displays if the drawings aren't sufficient. 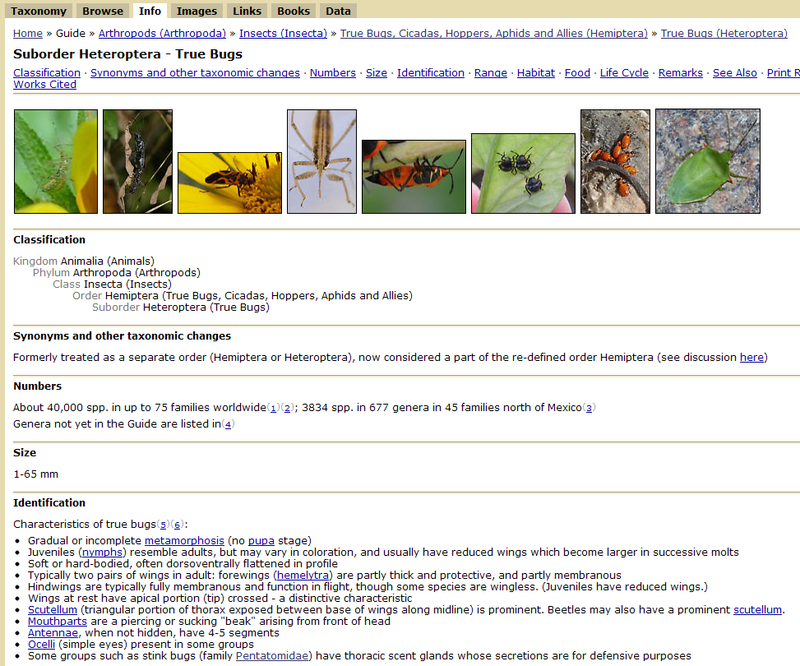 For the bug I want to ID, I have to go with a process of elimination and a little bit of guesswork. I know it's not a fly, bee, grasshopper, etc. 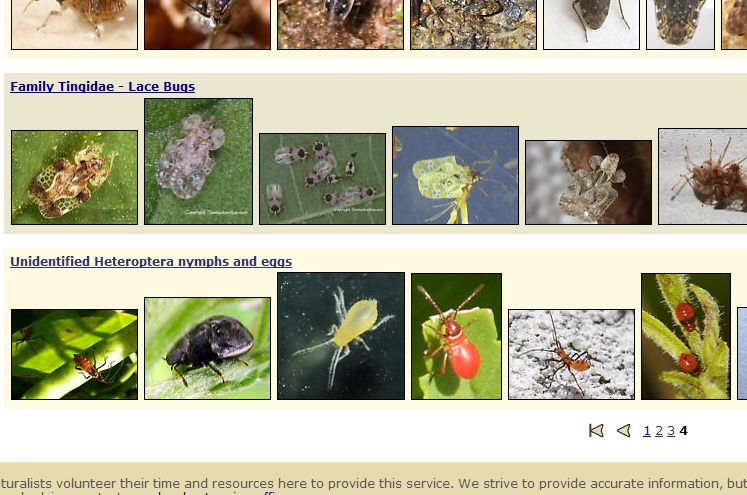 and the only category that really seems to fit is the "true bug" group. I have to admit that since I've been to bugguide several times before I already know what sorts of insects are in the "true bugs" group, but even if I didn't I might first pick the wrong category and would eventually get to "true bugs" anyway. On this page you'll see the different families that make up the "true bugs". For me the names are not important right now -- it's the images that matter. 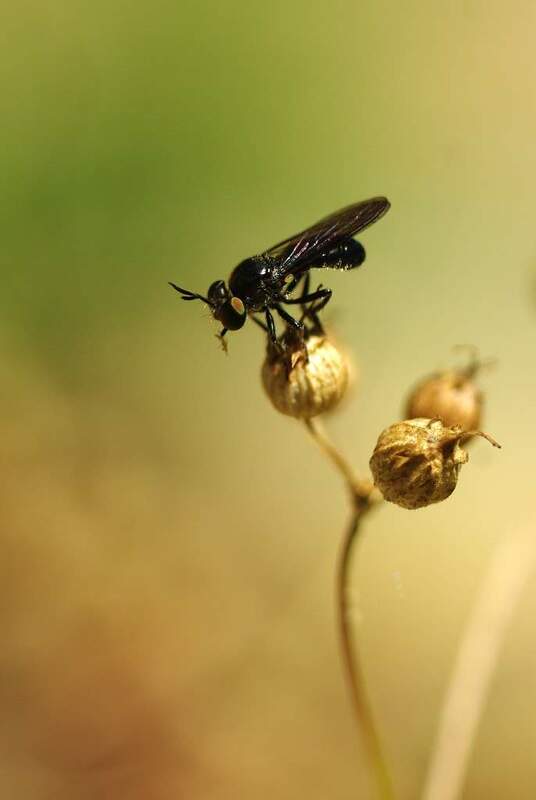 I'm looking for anything that looks somewhat similar to the insect I'm trying to ID. If you don't see a likely candidate, make sure you check the bottom of this page to see if there are additional pages. In this case, there are four total. Okay, now I'm seeing something that looks familiar. 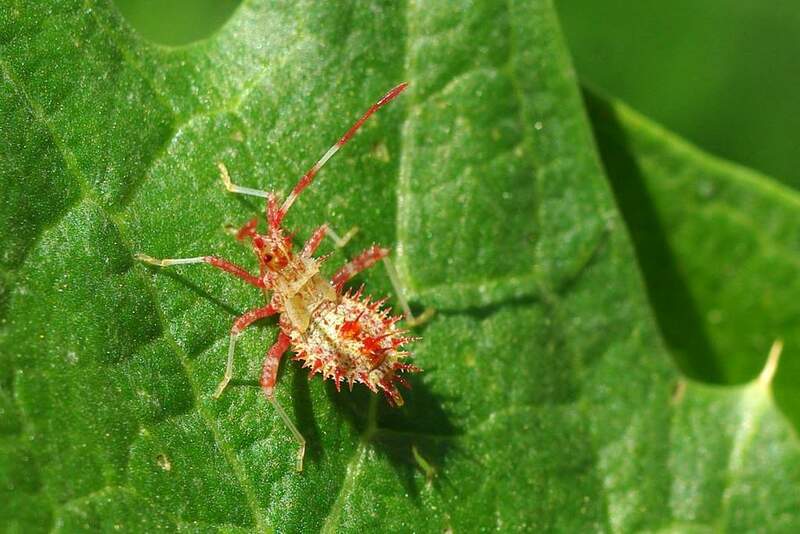 Although my bug is spiky and most of these photos show non-spiky bugs, the spikes are probably a feature of the nymphs, and the adults may not look the same. We're getting close though. 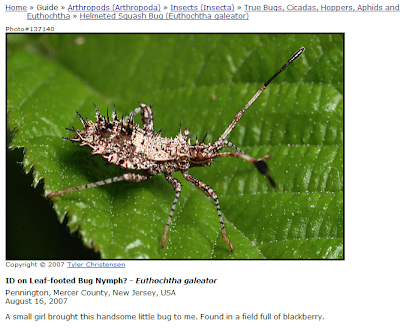 The "leaf-footed" bugs look like the best shot, and since that's what the comment in the other photo said too, I think it's a good bet. 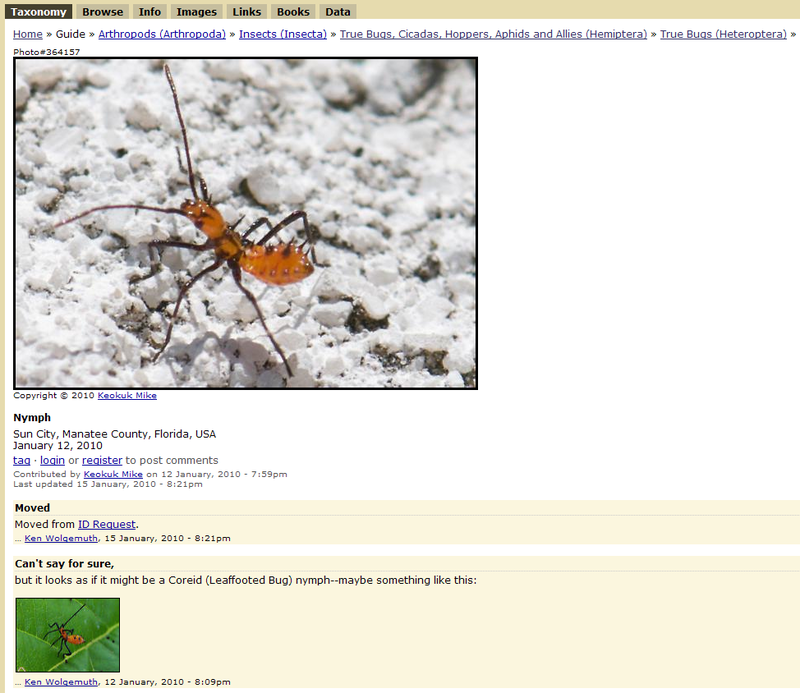 Do I see an exact match to the bug in my photo? No, I don't. But I'm pretty sure we're in the right family now. What makes it difficult is that the nymphs change their looks a bit every time they moult, and as I already mentioned they can look much different than the adults. 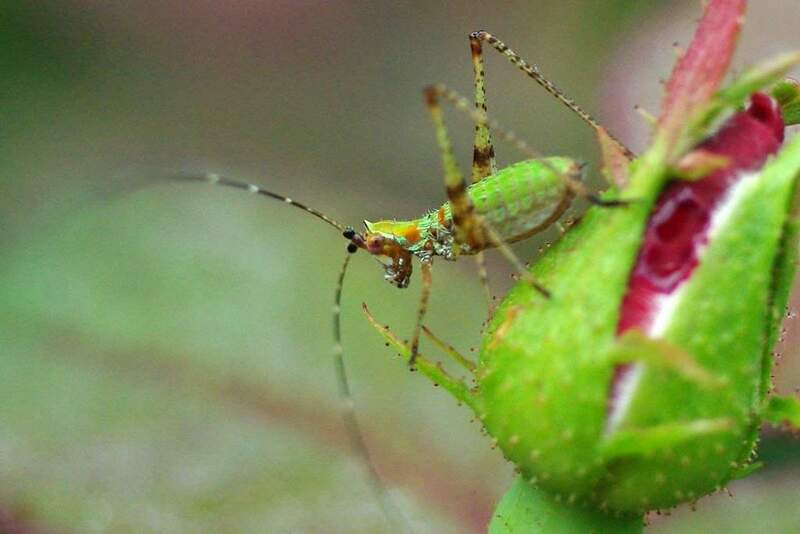 I'm going to say that the bug in my garden is some sort of squash bug. I could probably read a little more about it, or Google "squash bug", or maybe "squash bug cardoon" since I found the insect on a cardoon and maybe find more information, but this is good enough for now. Don't forget to click on the "browse" tab! 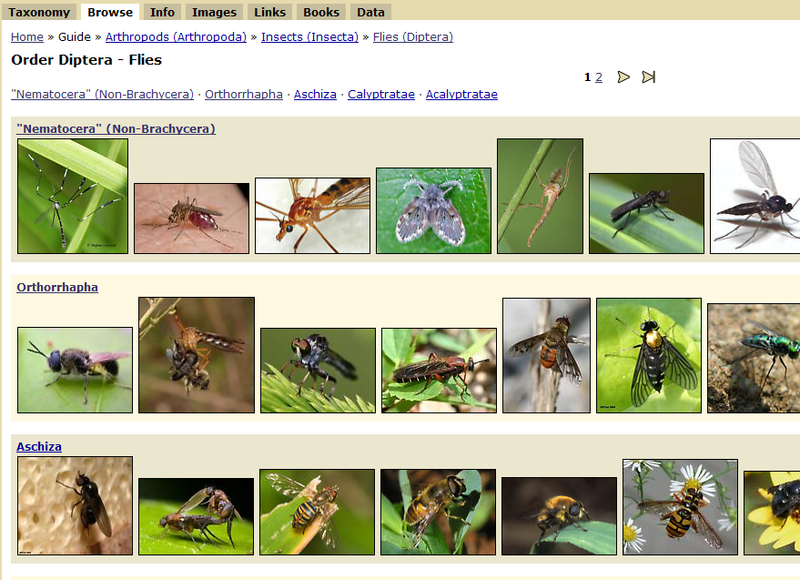 Luckily there are fewer types of flies than "true bugs", and I even see a possible match on the first page -- in the first row even! 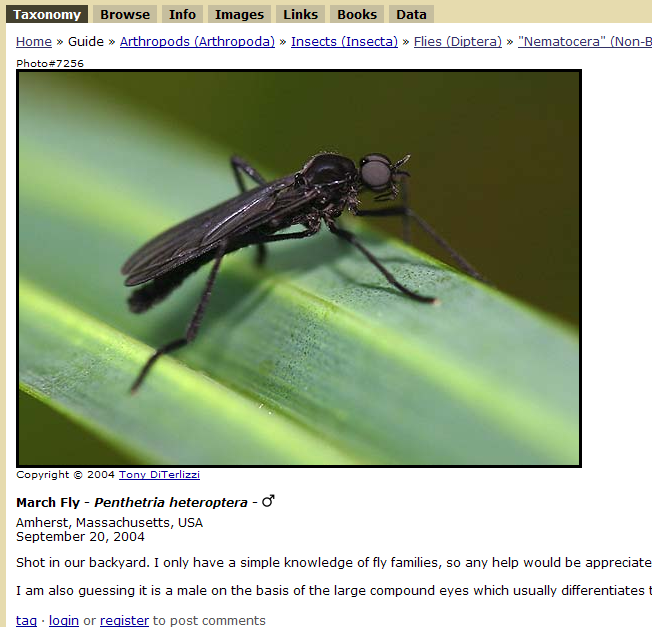 This looks like a strong possibility: "March Fly". It's not an exact match, but it's pretty close. Just to be sure I'll look at the second page, and will also take a quick look at the bee and wasp pages too. Once I saw some of the wasps and bees though, I knew this had to be a fly because of the eyes -- bees and wasps just don't typically have eyes like this. 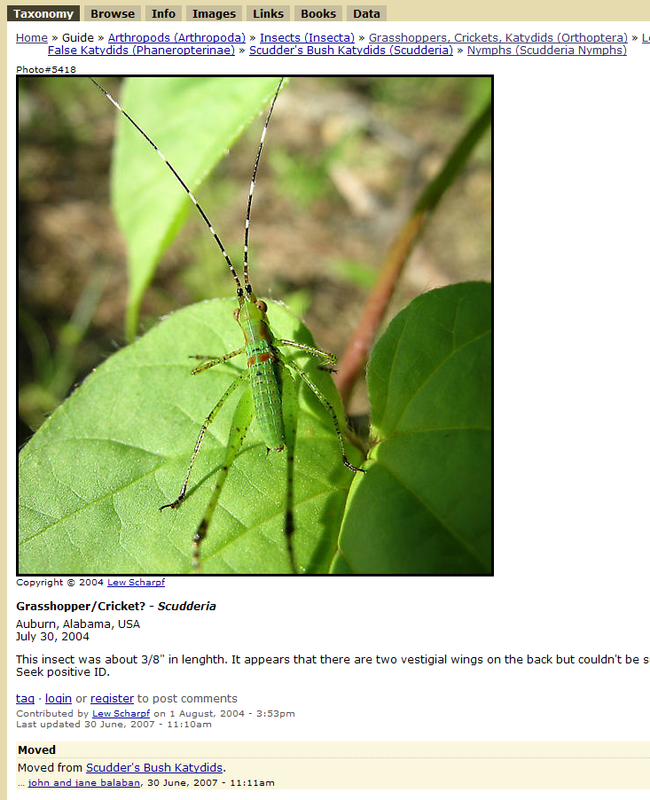 I remember that this is a katydid, but I don't remember what kind. 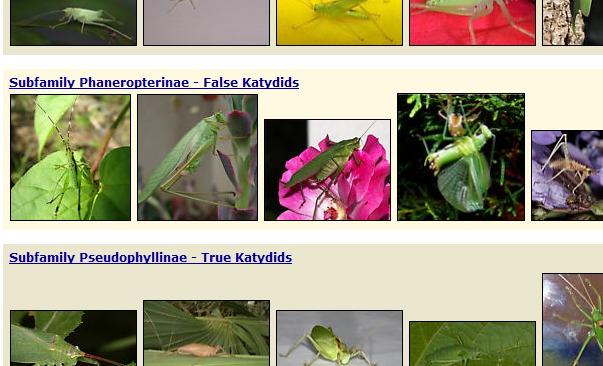 We can pretend for a minute that I didn't know it was a katydid, but I'd definitely click "grasshopper" to start with on this one. There are only two choices here, and it just has to be in the second one: the "long-horned..." suborder. 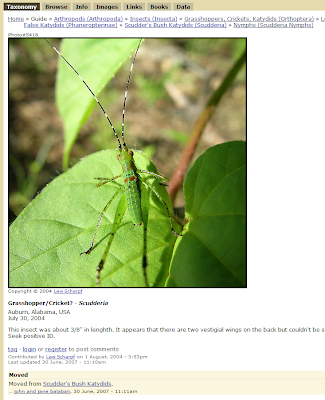 Yes, I'd have to say that "Scudder's Bush Katydid" is what this guy is. The top line of links on each page (in blue) can give you more information -- don't be afraid to click around! 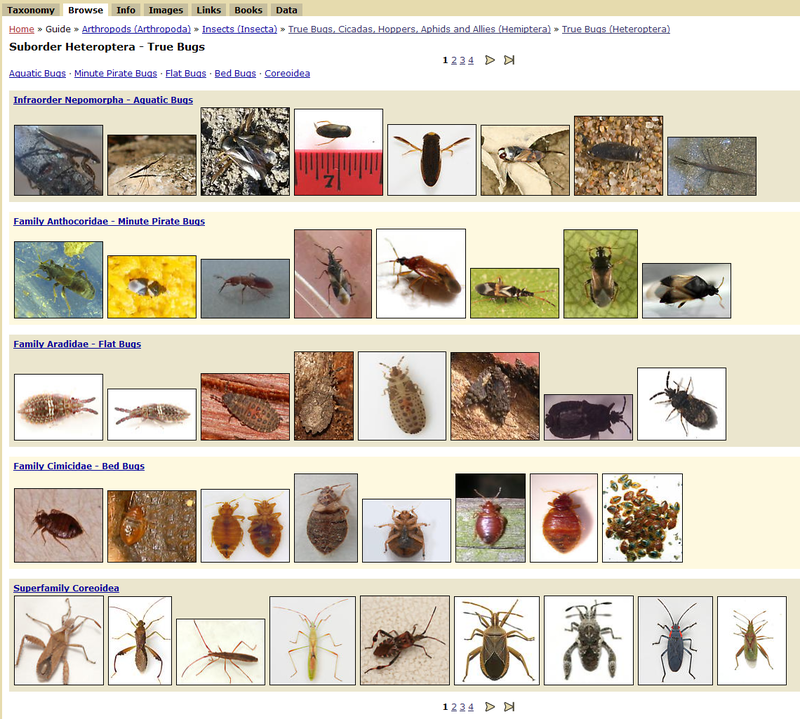 So the general procedure is: select the "type" of insect using the drawings, then "browse" and find the closest match to what you have. You may need to click on several different images before you start narrowing in, but with some patience and a bit of luck you should be able to find a match, or at least something close. 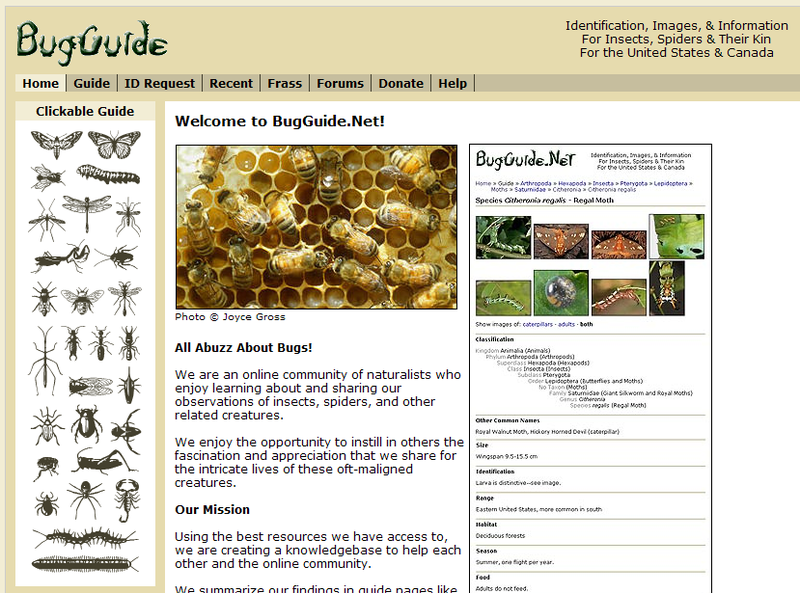 Unfortunately bugguide only covers North America, so if you're in another part of the world this may not help you. 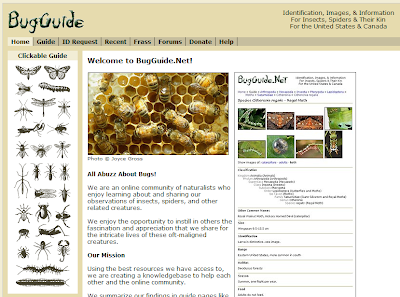 There are a few other bug resources around like What's that bug?, and often times you only need a general idea of the type of bug before you can turn to Google, but I start with bugguide nearly all the time. 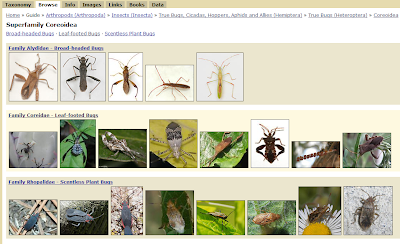 I love Bug Guide -- it's been the key to much of my insect ID. Excellent how-to, Alan!